Overview – How Can Plenty Vaporizer Help You? Plenty Vaporizer will provide an excellent experience with vaping medical marijuana herbs and waxes. There are plenty of whip based desktop vaporizers on the market today. Most of them offer almost the same product. 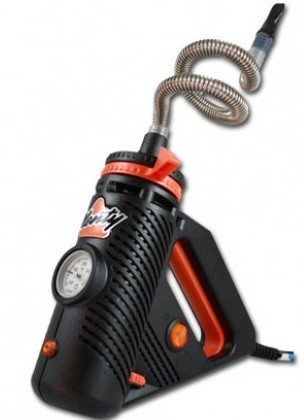 Storz & Bickel decided to be innovative and do something different, which resulted in the Plenty Vaporizer. The Plenty Vaporizer is a handheld design that makes it unique from other everyday whip style desktop vaporizers. The Plenty Vaporizer is German made, which is an indicator of its high quality. We all love the quality of German cars and other German made products. The Plenty Vaporizer is no different when it comes to German made quality. Let’s take a closer look at this unique product and move onto the next part of our review. 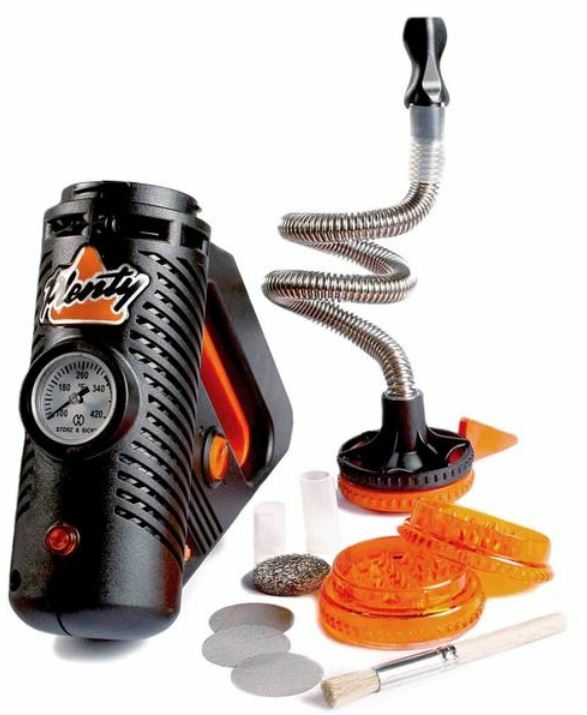 The Plenty Vaporizer can be used to smoke both medical marijuana herbs and waxes. 1.The device operates using a very high quality stainless steel cooling coil as opposed to the silicone whip used by most other desktop vaporizers. You can use a temperature dial to precisely control the temperature between 266 and 395 degrees Fahrenheit. Additionally the device has a double helix heat exchange system, which provides high yield vaporization and excellent heating of the air. 2.What I personally admire about this device is how safe it is. First of all, it has a bimetallic regulator that allows for safe usage of the device. There’s also an auto switch off feature, which is my personal favorite. If you’re a little obsessive like me, you can keep wondering whether or not you turned the device off before leaving the house. Now you can rest assured that, even if you forgot to turn the device off, it’s going to turn itself off on its own thanks to the auto switch off feature. You can enjoy your day without imagining the house burning down because you left the vaporizer turned on. 3.The huge herb or concentrate chamber is another popular feature of the Plenty Vaporizer. It can store herb for up to four vapers. The size of the chamber also impacts on the quality of the vapor that is produced. The wide chamber gives a greater surface area, which produces the thick vapor. 4.You can tell that the vaporizer is unique just by looking at its picture. Many have likened its design to a power tool; which isn’t necessarily a bad thing, unless you’re obsessed with decorations. The design has a perk and a con. The perk is that it’s a rather portable device. So you can travel with it and even take it to a friend’s house. The con is that you need to hold it while pulling. Its heat up time is 3 minutes. To be completely honest, there are vaporizers on the market that have shorter heat up times. However, a 3 minute heat up time is still the norm for most devices on the market. Basically, we say that devices with a 3 minute heat up time are the standard while those with a shorter time are the notable exceptions. • Grind the herbs as finely as possible. • Place the liquid pad in the chamber and add the herbs on top of the liquid pad. This prevents the herbs from becoming loose in the chamber which can have a negative effect on the quality of the vapor. • Once the herbs are in place you can now turn on the device and adjust the temperature accordingly. • When the adjusted temperature is reached and the device is ready for use you’re going to hear a click. • You can now start vaping. 1. For the first few times, we recommend turning on the device and setting it to the highest temperature. This allows clearing of any substances remaining from the manufacturing process. 2. For thick vapor take slow and long draws. 3. 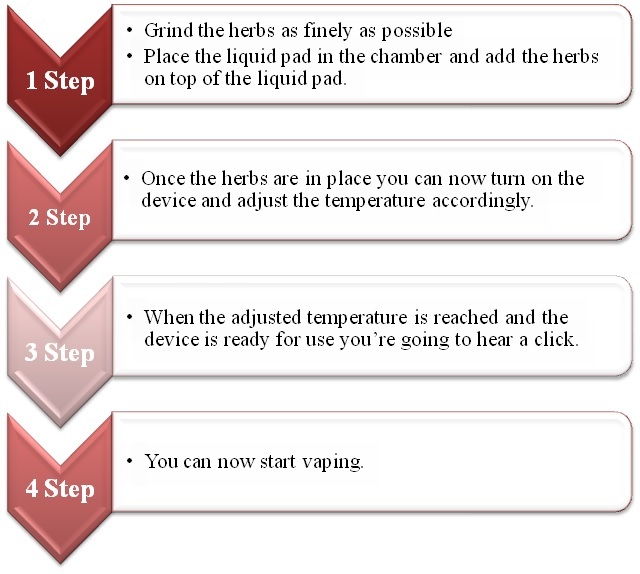 Make sure to use the liquid pad to prevent the herbs from moving around in the heating chamber. 4.If you want to keep the device upright on a table just put the brush that comes with it in the hole present on the bottom next to the temperature knob. 1.Use the brush to clean the screen. 2.Use a cotton soaked in alcohol to clean the chamber. 3.When you’re done cleaning turn on the device and let it heat for a few minutes in order to get rid of any remaining alcohol in the chamber. 4.You can clean the mouthpiece by detaching it, soaking it in alcohol, then rinsing it with warm water every once in a while. 2.Can be used to smoke marijuana herbs as well as concentrates. 3.Safety features such as the bimetallic regulator and automatic switch off. 1.Design looks like a power tool. 3.Often needs to be held while vaping. Our final verdict is that the Plenty Vaporizer deserves a 4.7 out of 5. Its ease of use and cleaning – along with the ability to vape both herbs and waxes – make it a great option. You can never go wrong with the auto switch off feature either. The large heating chamber allows vaping sessions for up to 4 people. However, the fact that it can get too hot and the somewhat high price brings down its rating a bit. Thank you for reading our Plenty Vaporizer review. We hope that we were able to tell you all about this unique desktop vaporizer that looks like a power tool. If you have any prior experience using it then please share it with us in the comments section. How portable is Plenty? I have read many shiny reviews about it. But can it fit a pocket or a small bag? Alex..Plenty can fit in a small bag but it is too big for a pocket. It doesn’t have batteries. So, if you need something portable that provides a very good vaping, I would recommend looking at Crafty or Mighty vaporizers.